Sleep is the only respite from the reality of homelessness for Sonnet. Sonnet has lived on the street for the last three years, most recently she took shelter in a tent popped up under a bridge in St. Charles County. Sonnet took photos of her friends which she considers family. “Family isn’t always blood,” said Sonnet. She also took photos of her living space—under the bridge—and the places she travels for food and showers. 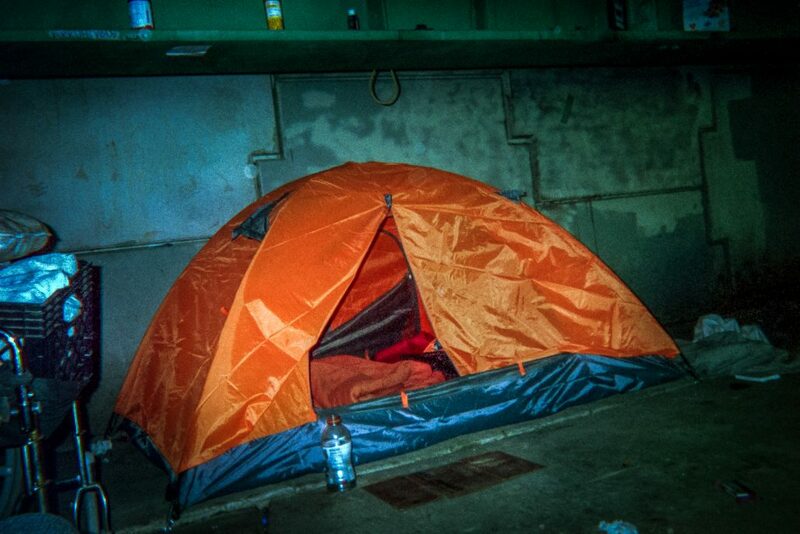 Her bright orange tent tucked into the corner of the bridge shows the reality of her only shelter. Taking a shower is not a simple task, but requires Sonnet to travel to a park restroom or truck stop to clean up. Her favorite photos, however, are of her friends sleeping. Sleep is a brief respite for those living on the streets. Sonnet shared some tips for those assisting the homeless. “Don’t put soap in the same bag as food. And 90 percent of homeless people don’t have teeth, so don’t put granola bars in the baggies,” said Sonnet.